Purchase Friends of the Air Show tickets for access to the Friends of the Air Show chalet. 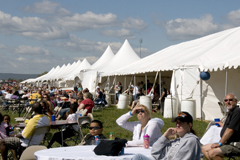 This includes show line seating, a catered meal and easy in and out access to see static displays and other attractions. Kids under 10 are free with a ticketed adult. Friends of the Air Show tickets will be available for purchase at the Martinsburg Mall at the customer service counter and the 167th TFR Federal Credit Union in Martinsburg in March. Purchase a VIP Family Package for access for four to the VIP Chalet (plus up to two children under 10.) This package includes showline seating for four people over the age of 10 plus two children under the age of 10, heavy hors d'oeuvres throughout the day, drinks including water, soda, juice, beer and wine, easy in and out access to see static displays and other attractions, four t-shirts, one VIP parking pass, and the possibility of meeting air show performers. VIP Family Packages will be available at the Martinsburg Mall in March.